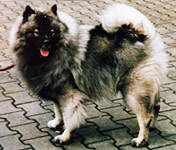 The Eurasier is the youngest German breed. Form the onset the aim has been to breed a family dog. Eurasiers want to stay with their human pack throughout the day. They suffer when kept in kennels and should not be left alone for too long. 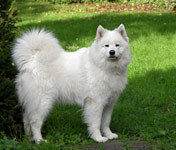 Between 1960 – 1973 this splendid breed with its large personality was created by crossing three breeds, the Chow-Chow, Wolfsspítz and Samoyed. 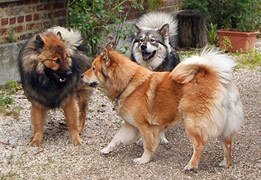 The name EURASIER was based on the regions of origin of these 3 breeds – Europe and Asia. Through strong selection and consistent breeding, the Eurasier has developed into a distinct breed which is comfortable in today’s environment. 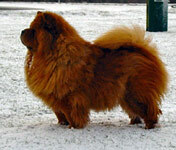 The Eurasier with its attractive colouring pleases aesthetically. Particular colourations were never selected so that in time a variety of colours developed. Only white, pinto and liver-coloured are not permitted by the FCI-Standard 291 and these are not allowed to breed. The entire body is covered by a thick under-coat; most also by a harsh top-coat of medium length. This thick coat resists the cold, does not attract dirt and is therefore easy to groom. They are a medium-sized, spitz-type dog of harmonious proportions and are generally very healthy with a strong constitution. Eurasiers are self-confident individualists, calm and balanced. They are not easily bribed and therefore are good watch-dogs. They love the whole family and are very attached to their ‘pack’. They are very good with children and are cheerful playmates, if the children accept their personality and don’t treat him as a toy. With strangers they are usually neutral or reserved. On walks they are excellent companions as they do not normally have a strong hunting instinct and do not follow scent trails. Eurasiers want to take part in the day-to-day life of the family, be it a single person or a large family, be it in a flat or a house. If the dog would have to be left alone all day, we would not recommend a Eurasier. Eurasiers are said to be easily trained and many dogs have successfully completed the companion-dog test. They are very intelligent dogs and quickly learn how to get their own way. However, with treats and praise they can easily be motivated and convinced to carry out the wishes of their humans. Drill, harshness and repetitive exercises will not achieve anything. If kept well they might enjoy a life of 12 – 15 years. includes in his character the best features of the original breeds - they are all united in the Eurasier. In appearance exist the manifold colour varieties and colour combinations of the original animals.